I wanted an AC bus to return from Davanagere after exam work. I checked up for private operators, but none of them matched the timings I wanted. I checked up the KSRTC website, and found there was a bus leaving to Bangalore at 1730hrs. Without a second thought, I booked on this bus, and selected a seat towards the middle of the bus. I was getting late. I had more students for the exams than I had expected and it was taking more time to finish. I had already received a message from KSRTC with details of the bus. After a bit of speeding up, I somehow completed the examination by 1705hrs. The associated paper work took up more time, and I left the exam centre sometime around 1715~1720hrs. I had hardly 10 minutes to spare for the bus, and the bus station was about 7 kms away from the college. My junior in college and the internal examiner for this examination, took out his bike and we rushed to the bus station. Some traffic signals on the way, and some roads under repair meant we got late. I got a call from the conductor asking for my whereabouts - I informed that I'd reach in less than five minutes - he sounded a bit upset about the delay. I reached the bus station exactly at 1730hrs - I ran across the road and into the bus station. I could see the bus parked at the platform. Seeing me run towards the bus, the driver got relaxed, and got set to start. I got into the bus, and we got moving at 1735hrs. The conductor was very composed - he did not argue for being late - but I really apologize to the other passengers on the bus for the delay. Since the exit of the bus station was jammed, the driver took the bus out of the bus station through the entrance of the bus station. They got some more passengers from the road side - all of them heading to Durga aka Chitradurga. The conductor checked my ticket after the bus started - he collected Rs. 27 towards the newly added service tax and issued manual tickets for the same. The bus: when we stopped for break.. The played a movie soon after the bus entered the highway. For some reason, the bus never went above 75kmph throughout the time on the highway. Except for overtaking trucks, he was cruising on the left lane for most of the time. I dozed off for time in between. When I woke up, we were nearing Chitradurga, and it was raining. We entered the bus station at 1839hrs - some twenty minutes late. Passengers boarded quickly, but it took us some time to get out of the bus station due to the haphazard parking style of buses there. We got out of the bus station by 1846hrs. I was terribly hungry by now - I didn't have time to have some food before starting, and it'd been more than 4 hours since my last meal. It stopped raining soon after we left Chitradurga. We pulled in for a break at Hotel Athiti Plaza, near Hiriyur, at 1921hrs. This is a place frequented by KSRTC buses operating on this route - its a typical bus motel. I was desperate for some food, and focused on grabbing something to eat. After stuffing down some food, I was out near the bus, trying to get some pics of the bus. The break was really quick, and we got moving again at 1942hrs. I dozed off soon after we started - the movie that was being played did keep waking me up again and again. Sometime in between, the first movie got over and a second one started. I woke up just as we were exiting the elevated highway over Tumkur road, and we stopped by at Taj Vivanta to drop passengers (2207hrs). I was quite surprised that we had made up quite some lost time. I pulled up the backrest and somehow kept myself awake. We took the chord road and then roamed through some bylanes to reach Navarang (2219hrs). 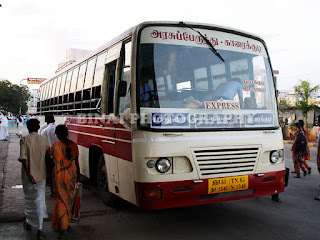 The bus hit a traffic block near Okalipuram, and the driver took the bus through the platform road and entered Majestic through Tank Bund road side, instead of the usual approach through the railway station side. I got off the bus outside Majestic (Kempegowda Bus Station) at 2236hrs - just six minutes behind schedule! 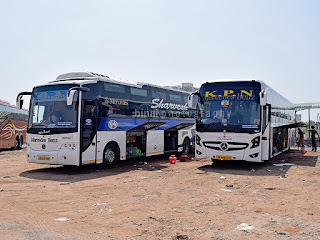 The bus that brought me to Bangalore from Davanagere was KA-01-F-9060. Its odo was displaying random characters, but from the driver I understood that it has done over 12 lakh kms. 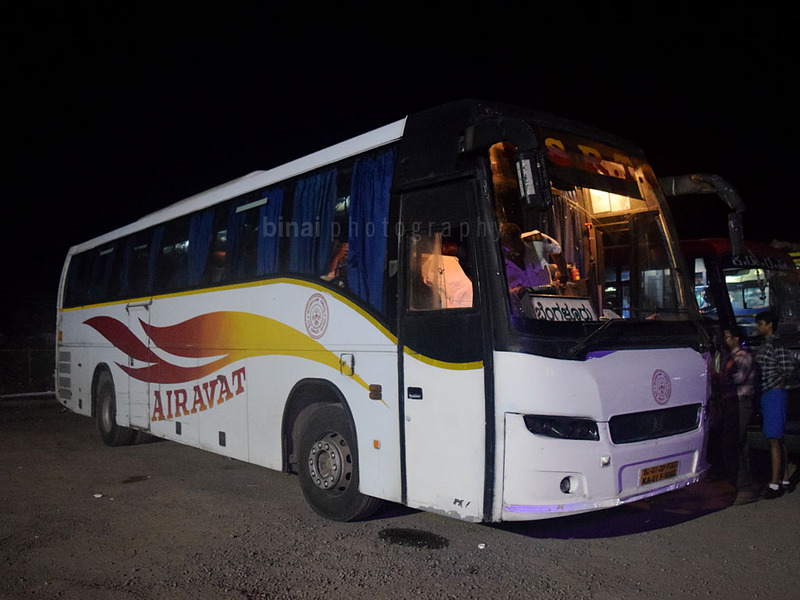 The bus was operated by crew of Davanagere depot, but the bus bore markings of Shimoga depot. The vehicle was maintained fairly well - no rattles or extra sounds. My seat was right below the AC blower unit - it kept making a lot of noise, though. The seats were well maintained, and the crew, as usual, were well behaved as well. 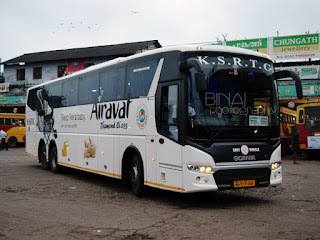 KSRTC is a great option for traveling to destinations like Davanagere or Shimoga, from Bangalore - they operate a good number of Airavats suiting to most needs. My only suggestion would be that they could provide blankets on request - especially since this particular bus runs under darkness and a late arrival in Bangalore means most passengers would sleep through the journey. Its not a deal breaker, by any means. Will I take this service again? The best option for routes like there, in my opinion.